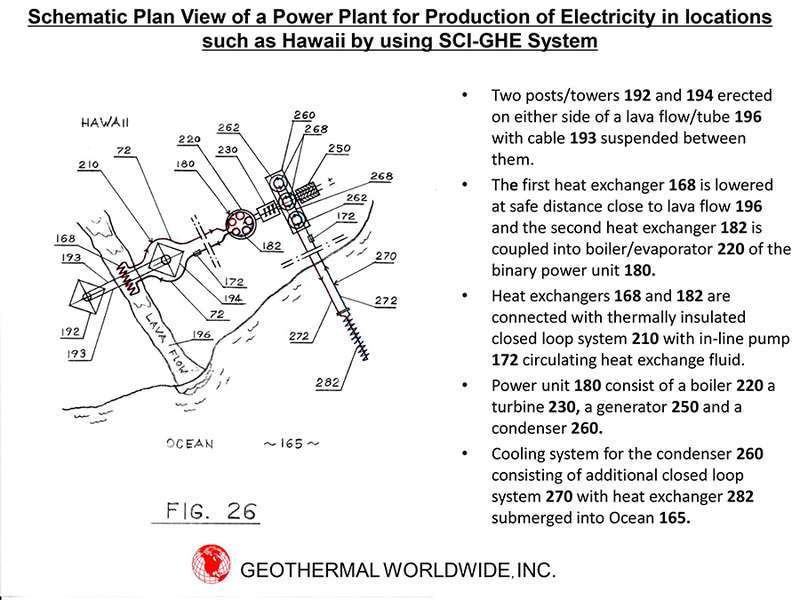 PRODUCTION OF ELECTRICITY IN LOCATION SUCH AS HAWAII WHERE LAVA IS ACCESSIBLE by using our methodology. State Hawaii is spending about $1 billion dollars per year for purchasing oil for production of electricity. The big island Hawaii has slow moving lava dropping into Ocean usually through established lava (tube) flow. Heat from lava, which at this time is dispersing in air, can be effectively harnessed for production of electricity. Selecting location with established lava (tube) flow. Erecting two towers on either side of a lava flow (tube) flow with cable suspended between them. Lowering first heat exchanger at safe distance close to lava flow and the second heat exchanger coupled into boiler/evaporator of the Binary Power Unit nearby at safe distance. First and second heat exchangers are connected with thermally insulated closed loop system with in-line pump circulating heat exchange fluid through it. Power unit consist of a boiler; a turbine; a generator; and a condenser. Binary power unit can be mobile (on wheels – for example 3 trucks) at safe distance nearby. If lava changes its flow binary power unit can moved out of zone on time. Only possible lost could be first heat exchanger and/or towers which are replaceable and not very expensive structure. Cooling system for the condenser consist of additional closed loop system with one heat exchanger submerged into Ocean. Many such modular power units can be installed in suitable locations. Our system is perfectly suited for Hawaii’s situation. Our system doesn’t require geothermal drilling, controversial fracking, hydrothermal reservoirs, permeability of the rocks, and substantial amount of water which is the case with conventional geothermal systems. Our system doesn’t pollute environment or interfere with lava flow. It only absorbs heat from above lava which is dissipating in air anyway.